Well I just took a lovely walk around the farm and things are looking fantastic! There are tiny cucumbers bursting forth off the vines and loads of little summer squash. We are also hoping for a big haul of peas this week as the plants all look heavy with delicious peas. The lettuce that was decimated last week is also starting to perk back up which is great news. Those sad little eaten carrot tops are also starting to grow. Nature is pretty resilient which is good news for us. 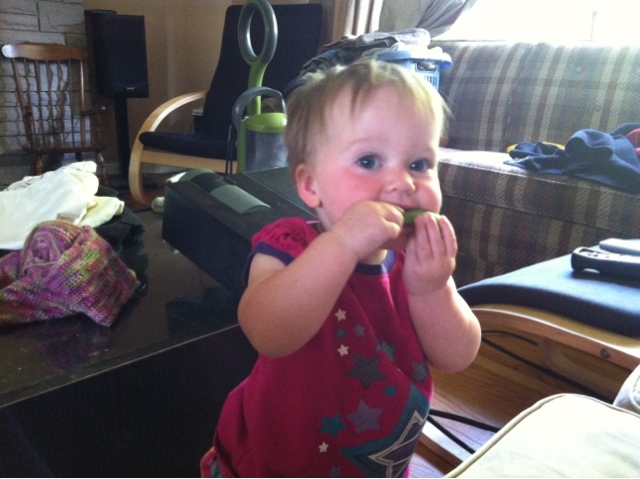 That's Sydney munching on a fresh pea. She is pretty sneaky and just eats the super sweet tiny peas inside and discards the shell.